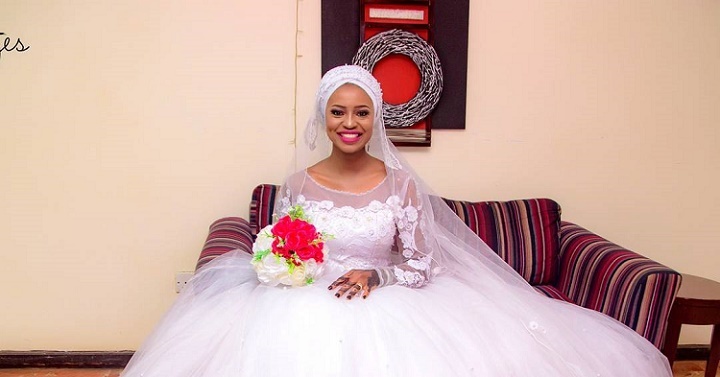 One thing is certain: having a nuptial doesn’t come cheap — from getting the perfect wedding dress, your killer accessories, dreamy decor and the rest, it has never been cheap — but Garuba Abiola who said ‘I do’ a few days ago found a way to cut her wedding costs without looking cheap. When we first saw her bridal gown, we thought, “oh wow, that’s pretty!” The beautifully crafted fit and flare number with a delicate floral pattern was easy and modest, creating the world of fantasy for the bride. The more we stared at her, the more we said she looked elegant for the big day but it was hard to guess the price range of her dress. Garuba decided not to opt for a couture dress because, according to her, after contacting many high-end designers, inquiring about how much they could outfit her, their prices were unscrupulous and the cheapest happened to cost N120,000 ($320 equivalent), which of course, was still far-off her budget. The Kwara State-born who just graduated from Ukrainian Universty as a medical doctor figured out that the economy of the country is trying to recuperate, hence she needs to cut costs, which she ditched the couture designers and then fall back on a local designer who finally crafted out her dream wedding gown. As she pointed out, she had to work closely with the designer to get her specific style. “When I went for the first fitting, I didn’t really like what I saw, I made some changes so the style can compliment my stature a little bit more. Don’t you love the outcome? She also made my bridesmaids dresses,” the bride said. And at this point, you might be wondering how much the medical doctor actually spent to get her dress. Could it be N90,000, N70,000 or less? Although she wasn’t specific, the bride noted that she spent way less than what you could imagine: “To cut the long story short, I spent way less than what I would have paid to all these big brands that will end up giving someone’s wedding dress to a celebrity . As the magpie that we are, we were curious to know the exact amount and after contacting the bride, she was very proud to tell us N50,000, proving just how much you can save by visiting your favorite local designer at the right time. Garuba isn’t only a medical doctor. She’s also a fashion blogger, who, while at school connects with other women through her headwrap styles and tutorials and she’s been featured in our style book for more than once. She’s married to the man of her dreams and we can only wish her the BEST!